Positionly review ~ World Class Online SEO Software! →Positionly review ~ World Class Online SEO Software! In today’s Positionly review, I want to introduce you to a world-class online seo software and a perfect WebMeUp alternative. Positionly is specifically designed with the sole purpose to take you to page one of search engines and keep you at that most attractive spot for so long. Is my website gaining new ranking position on SERP? Am I dropping or moving up the SERP? Is my blog gaining new backlinks? Are my competitors doing better than me? What do I need to do to get better on search engines? You understand that you can’t answer these questions properly without the help of a world class seo tool. This is where Positionly.com comes in to breath answers and make your SEO experience more friendly. 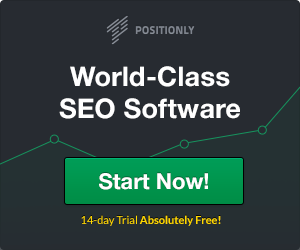 Positionly Review – The pro-level SEO tracking tools! Positionly is the best way to track and improve your website’s rankings in search engines. It’s a set of simple, powerful seo tools that make tracking search engine rankings fast and easy. It helps you monitor daily changes, measure keyword performance, and improve rankings with simplicity. It is simply pro-level SEO tracking tools in a refreshingly simple and usable interface. Start your 14 day Trial now! No CC required! If you have been a disappointed WebMeUp client, this is one of the most appropriate WebMeUp alternatives. Add your website to begin! One of the first things you do after signing up is to add your website using the very simple yet powerful wizard. On the next screen, you will have to tell the system which search engines and countries you like to track the position of your website. It’s important to note that your position on SERPs differs in different locations and of course different search engines. The results you also get differ with location. If you live in United States you’ll most likely receive results from United States for the typed query. Let’s assume that you look for a quite broad phrase like, petrol station. The results shown for the query would be relevant, but only if you would be in the UK or any other country where petrol station is commonly used. In US, the term gas station would be probably better. If you’re looking for a restaurant you’d be more interested in finding a one nearby rather than the best restaurant in the country, right? Ok. You are allowed up to 5 search engines and 5 countries. For USA and United Kingdom, you can go as far as tracking for local ranking. Obviously, you are going to be tracking your position for certain keywords on SERP. At this point, you need to enter these keywords, one per line. Note that once your campaign is complete, you will be able to enter more keywords, remove some or group them. Positionly will pull up a summary report as you can see from the image below. Now I loved this when I got to this point. I entered 4 keywords but the tool was able to pull more from my domain. You’ll be able to import keywords from which you’re getting traffic. You can see the traffic you’re getting from each entered keyword on the charts. You will be able to see your paid and referral traffic on one simple graph too! Postionly helps you compare your rankings with your competitors for a particular keyword. Such an analysis will give information on how well your overall website is performing in comparison to other websites that are trying to rank in Google for those keywords. Positionly will automatically fetch and add competitors based on the keywords you submit. You can manually add more competitors using the the Competitors Tab in your Websites Menu. – > Positionly and Backlinks! Are we gaining or losing links? Are the gained links nofollow or dofollow? What is the DA or PR strength of the page and domain linking to us? With Positionly, you can check and track your link building progress and see how it impacts your rankings growth. When analyzing backlinks, you have a few metrics to consider. Positionly makes it incredibly easy to check the backlinks you get. Thanks to simple and visual graph you’ll be able to evaluate and fully understand how your backlink profile impacts your rankings and overall SEO results. Now, there are different types of notifications you get from this seo online tool. However, you are able to set what you get and the frequency from within your account settings page. Mariusz Gralewski, CEO − Docplanner! Start your 14 day trial! Absolutely free! Unlike most online seo tools, you can take a Positionly test drive with absolutely no engagement. Your Credit Card data is never a requirement. The 14 day trial gives you full access so you can appreciate the tool before making a decision to continue. Click here to signup for free! Thanks for reading and leave your comment in the comment box below. Wonderful Review,I Will Use This Tool Later After Getting Adsense payment. Amazing review and amazing software I guess. The best thing is the trail version of 14 days. I guess I’m gonna be trying it right now. This is wonderful news and review i must say. Maybe this is the best alternative to Webmeup as you have said. Really looks promising. That’s great news and surely will check it out it out now. Just registered for a Free account. The features look promising especially the competitor’s analysis. My moz’s subscription expired 3 days ago, Do you recommend positionly or should I renew Moz again? Enstine Muki recently posted…How to double your sales in 3 days – Guaranteed! Whatever you write on your blog SEO is always a big factor. I have seen people using poor SEO service paying a big money. As they don’t know which one is good or bad. But this a really detailed review. It gives you a clear idea why you need it. Thanks for nice review. I haven’t touched with this stuff, i wanna know something.. Is this better than Semrush??? Thanks Enstine for this great blogging revelation, i appreciate your efforts in making the blogosphere unique, keep doing good and God bless you with much more wisdom. Interesting review of Positionly : I’ve never heard about it. I guess I’ll check it out. Enstine Muki recently posted…Attention! Donna Merrill will help grow your business! Its a great review. Thanks! I will surely signup for the 14 day trial. Thanks for this another review. Though there’s many SEO tools to track keyword’s of one’s blog. This one seems cool and promising. Hi Enstine the review was mind blowing and I have been using a few online seo softwares to scale up my blogs, I rely on SemRush a lot does positionly is more better than semrush. As I need to confirm before jumping onto this new tool. Awaiting for your reply. Blogosphere is very helpful and unique. I am able to keep a track and maintain our main keywords. This is really very great reviews about this SEO software and it has lots of fuction like top keyword. I want to check this tools. I hope this tools help me to check backlinks and search ranking etc. Any way thanks Enstine Muki for sharing such great reviews with us. Interesting article, My Blog Visitors recent months experienced a decrease in traffic, there seemed to be some way that I can apply here. Thank you for the information.